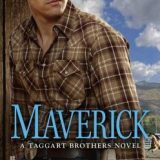 Maverick is the final book in Lisa Bingham’s Taggart Brothers series I have had such a blast with these brothers. I was delighted to read Bodey Taggart’s story. Full of suspense, and sweet awkward moments I devoured Maverick in a single sitting. 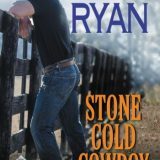 Stone Cold Cowboy by Jennifer Ryan is the fourth novel in her Montana Men series. Her brand of romance and suspense is addictive. I devoured Stone Cold Cowboy in one sitting. Ryan had me laughing, crying and swooning. 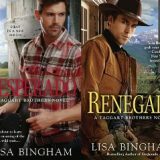 Today I am excited to share Renegade and Desperado by Lisa Bingham, the first two books in her Taggart Brothers series. Yep, I said BROTHERS and you know how much I adore series based on brothers. Did I mention they are cowboys? Yea-ha. First up is Renegade the second and newest book in the series. Both books work as standalone but I encourage you to read them both! 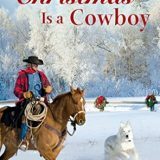 At Wolf Ranch by Jennifer Ryan is the first in her Montana Men series. 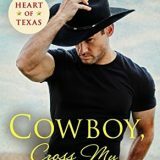 It has so many elements I love from the wide-open spaces to hot, strong, cowboys who just happen to be brothers. Catch me before I swoon! Ryan weaved suspense, a slow-burning romance and did it all in big sky country. I inhaled At Wolf Ranch and cannot wait for more.